They look like little ultra-cute pieces of chotcke sitting on a shelf into you turn them over, and then you see these pieces from Japan’s Décole are actually drinking mugs. 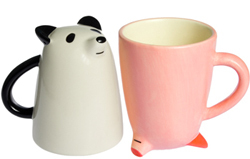 The Upside Down Animal Mug collection measures about 4 inches tall each (upside down or not) and come in three hyper-cute versions: cat, panda and piglet. These mega-cute little drinkers will set you back $20 each. Too much cute? Yeah, maybe. ***UPDATE 9/29/13*** Looks like things got a bit topsy-turvy at the link above; they are sold out. However, here is a link to the upside down panda mug: Decole Animal Face Mug – Panda. Hyper-mega-super-cute lives on!